Let’s take a trip back in time again, shall we. 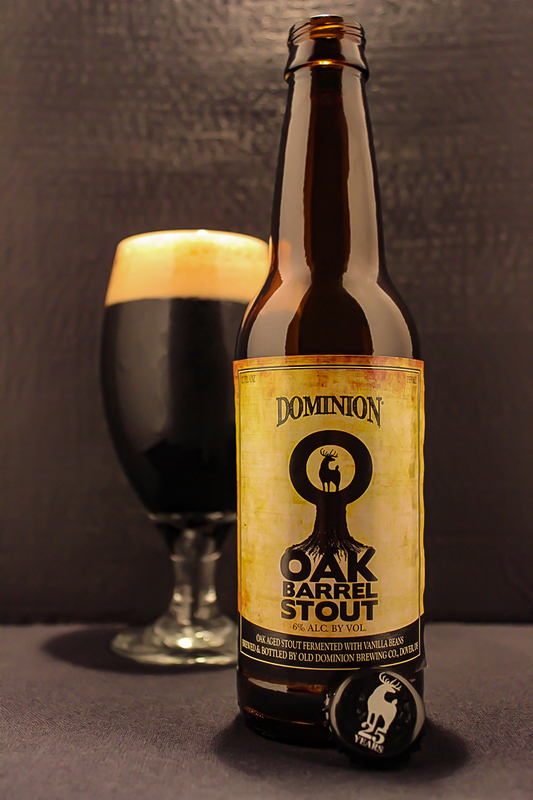 This beer, Oak Barrel Stout by Old Dominion Brewing Company was bottled on 03/25/14, and I drank this bottle on 6/13/15. As I have said before, I still like to include these old tasting note reviews, since the beer is still made and purchased today. Hell, even some of you out there might still have an old bottle like this one. Enjoy this retro review. Back when I worked at Big Hops Growler Station, I had a few customers who would bring me in bottles after they returned home from a vacation. This is how this bottle got in my possession. Gotta love friends who love Craft Beer as much as I do. The first thing that caught my attention was the simplicity of this label. Presented on a label that has an old paper texture to it, this one features a simple picture of a large oak tree with large roots at the bottom and a large “O” at the top. Within the circle there is a silhouette of a large buck. The words Oak Barrel Stout written under the tree. Simple, yet for me, interesting. The fine folks over at Old Dominion Brewing Company has since changed this design to fit their Pin Up Series. The label is now packed with color, artwork, and quite frankly, boring, in my opinion. Simple beats flashy here. Check out the new artwork here. I poured this beer into an American Pokal Beer Glass. Oak Barrel Stout’s appearance was near black in color topped with a half inch khaki foamy head. Decent retention as a thin layer atop the beer, leaving soapy spots on the glass. Smoked and peated malts are first to hit the nose, which was then followed by a big whiff of the vanilla beans, with its sweet smell and similarities to lactose/milk. The bulk of the aroma was light caramel, malts and grains, giving it a dark bread body. The oak chips are present and tailed off each whiff. The taste was smoke and peat, again at first. Oak chips actually hit next, with a blend of dark bread graininess, and mild caramel. There is an sweetness with the vanilla beans that hit the palate last for me, and given the overall smokiness to this beer, it tastes like a milk chocolate candy bar. The body was a lot lighter than expected. In fact, it’s on the lighter side of a medium body. The mouthfeel is a bit astringent, yet silky. Very mild carbonation, and no real alcohol was present. This beer finished dry. Overall, it was a very decent beer, and I am very glad I was able to taste it. The thin body is what affected my overall rating on this beer. I have not had any other beers from this brewery. Hopefully, one day that will change. Please seek out this beer and give it a try for yourself. Cheers! Metal Connection: Opera IX, an Italian band that is either loved or hated, with not many people being in between. From 1992-2001, the band was fronted by a charismatic front woman known as Cadaveria. She was involved in this band during the rise of the Underground Metal scene in the 1990’s. I remember hearing their debut full length, The Call of the Wood in 1995 when I was in High School. Their songs were long, and in the style of Gothic Doom Black Death Metal. Yes, that’s a lot of styles, but it was true for this band. Their second full length album, Sacro Culto was released in 1998 on Shiver Records. They stayed in the same style as their debut, recording 6 tracks totaling over an hour long. The shortest song is 8:50. For obvious reasons, I went with their opening track from this album called “The Oak.” This song is 10:40 in length. “The Oak” is more of a Gothic Black Meal song in style. It is very heavy with the keyboards, as they are produced at a high volume on this album. The guitar work is heavy, but the tone is light and fuzzy. In my opinion, this is the best track off this album. My favorite album released in the Cadaveria era, though is their 3rd album, 2000’s The Black Opera: Symphoniae Mysteriorum in Laudem Tenebrarum. Opera IX and Cadaveria parted ways in 2001, and she now fronts a band by her own name, and Opera IX has continued with a male vocalist for a few years, then back to a new female since 2014. Enjoy “The Oak” by Opera IX.